This noted Baptist clergyman, author and poet is remembered for writing the patriotic hymn "America" ("My Country, 'Tis of Thee") -- supposedly in half an hour on a scrap of paper -- in 1831. 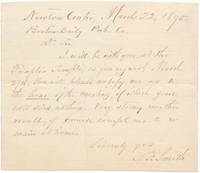 ANS, 4½" X 4", Newton Centre, MA, 22 March 1895. Addressed to "Dr. Sir" at the Boston Daily Publishing Company. Very good. Couple of quite faint folds; minor mounting traces on verso. Cryptic content regarding a meeting: "I will be with you at the People's Temple, as you request, March 27th. You will please notify me as to the hour of the meeting, of which your note said nothing. Very stormy weather would, of course compel me to remain at home." Nicely penned in brown ink. Recipient is possibly editor Robert James Long, who was elected president of that company in 1895. This Cuban became influential in introducing and popularizing Latin music in the United States first by managing the band of his brother Don Azpiazu and then by taking the stage name Don Mario Antobal and forming "Antobal's Cubans," who toured the U.S. and became popular throughout the 1930s; he later founded a music publishing company. TNS, 1p, heavy stock buff 5½" X 3¼" postal card, New York, NY, 9 September 1933. Addressed to Arnold Gates (1914-93, noted Lincoln/Civil War scholar). Near fine. "Thank you, in my own name and in that of the boys, for your congratulatory card." Signed boldly simply "Antobal" in black ink. Nice example of this uncommon autograph at the height of his American fame. This Hungarian-American operatic mezzo-soprano made her debut in New York in 1911 and headlined at the Metropolitan Opera for 19 seasons. IPS [Kesslere], heavy stock 8" X 10", n.p., n.y. [dated 1926 on verso in another hand]. Near fine. 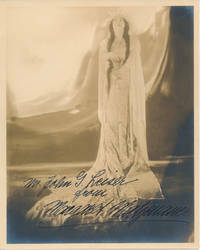 Dramatic sepia-tone full-length portrait of Matzenauer in "Parsifal," beautifully inscribed and signed large and bold in black ink near the bottom: "Mr. John G. Leiser / from / Margaret Matzenauer." Quite striking and signed at the height of her fame -- and uncommon. Prussian composer (including the noted symphonic ode "Das Meer"), pianist and conductor. On a 4¼" X 2 3/4" slip bearing an imprinted "The Autograph Collection of / Howes Norris, Jr." along the top, Nicode signs large and bold in black ink, adding place (near Dresden, Germany) and date below: "Langebruck i/Sa. 7.9.12." Near fine. Minor mounting traces on verso. A handsome example. New York: William Morrow and Company, 1967. Hardcover. Illustrations by author. 8vo. Brown buckram with color pictorial stamping and lettering. 96pp. Frontispiece, line drawings. Very good. Front jacket flap neatly tipped to rear pastedown. Ultra-tight and decent first edition of this young adult primer on Native American music and their instruments in a durable library-style binding. Discreet ex-library, the only real marking being a cross-out at bottom of title page. This country Western singer, guitarist and songwriter, whose style crossed over into rockabilly and honky tonk, exploded onto the music scene with several hit recordings such as "Honky-Tonk Man" and the Grammy Award-winning "Battle of New Orleans" in the late 1950s, but his career was cut short when he was killed in a car crash in Texas at age 35. IPS, 6½" X 6 3/4", n.p., n.y. Very good. Small tape stain at each corner and couple along right edge. 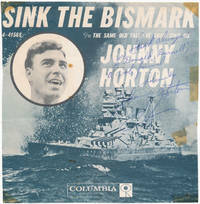 Paper front of the 45rpm record for Horton's 1960 hit "Sink the Bismark," largely a blue-printed photograph of this legendary battleship with Horton's circular-inset portrait at upper left. Just right of center, he inscribes and signs boldly in blue ballpoint: "Luck always / To 'Donald Burnell', / a real friend / Sincerely / Johnny Horton." Penned atop his large printed name (in white) and the Bismark image, thus decent but not superb contrast. This 1960 hit was one of Horton's last song released, dating this signing to shortly before his death on November 5th of that year. Unusual and attractive form of this very scarce autograph. Ozzie and Harriet's son grew up with America on this couple's radio and television show before becoming a pop and rock singing star in his own right in the late 1950s; a few film roles followed ("Rio Bravo" with John Wayne and "The Wackiest Ship in the Army" with Jack Lemmon, among others) and he added country music to his repertoire, but he died at age 45 in a plane crash in Texas. IPS, 8" X 10", n.p., n.y. Very good. Barely visible tape stain and staple holes at each corner in blank outer margin. 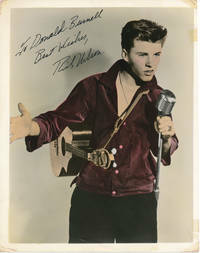 Handsome colorized half-length portrait of a young Nelson crooning into a microphone, guitar slung over right shoulder. In a blank area at upper left, he boldly inscribes and signs in black ink "To Donald Burnell / Best Wishes, / Rick Nelson." Undated, but of early 1960s vintage. A choice example from the height of his fame. Very scarce. London: Hutchinson & Co, 1956. Hardcover. Small 4to. Blue cloth with gilt spine lettering, pictorial price-clipped dust jacket. 268pp. Frontispiece, illustrations. Very good/very good. Faint binding edgewear, else internally fine; mild jacket edgewear. Tight and attractive first edition of this chronicle of English musical plays. Interestingly, front flyleaf bears the circular blind-embossed ownership imprint of well-known television character actor Robert Casper (b. 1924). New York: The Modern Library, n.y.. Hardcover. 12mo. Burgundy cloth with gilt spine lettering, pictorial dust jacket. viii, 469pp, (2pp ads). Grey decorative endpapers. Near fine/very good. Mild edgewear (mainly head of spine) to otherwise bright and lovely jacket; small ownership signature on front pastedown. First issued by ML in 1946, this fresh and tight copy of #241 is a later printing ($1.95 jacket flap price dates it to circa 1962). New York: Dover Publications, 1965. Hardcover. Complete 2-volume set. Burgundy cloth with gilt spine lettering, pictorial price-clipped dust jackets. 600pp, 758pp. Frontispieces, numerous line drawings. Near fine/very good. Jackets edgeworn, with a few small edge chips. A tight and quite attractive facsimile reprint of the classic 1905 Dodd, Mead first edition. A superb set of the classic, exhaustive text. New York: Independent Music Publishers, n.y.. Paperback. Music by Normand Lockwood. Folio (13" X 10¼"). Plain stiff tan wrappers. 113pp. Very good. Outer wrappers (only) a tad rubbed and faintly edgeworn, and entire text light age toned. Complete facsimile of the composer's handwritten score, presumably prepared for an actual performance of this history of the Civil War as told through excerpts from period songs. The 1959 hardbound edition (TN: Kingsport Press) and a softbound version (New York: Associated Music Publishers) foreshortened the original score by about one third. This unusual composer's manuscript facsimile would have been produced in an extremely small quantity strictly for those associated with the stage production. This particular copy belonged to noted Lincoln/Civil War scholar and radio broadcast pioneer Carl Haverlin (1899-1985), long-time president of music licensing innovator BMI (Broadcast Music, Inc.) -- he boldly pencils "Haverlin" at upper right of the plain front wrapper. This copy also bears two fine autograph additions: Tipped to the rear flyleaf and facing page (inside rear wrapper) are two Typed Notes Signed from the co-compilers, both addressed to Haverlins: At left is a TNS from Paul M. Angle (1901-75), 1p, 8½" X 11", Chicago, IL, 29 January 1952. Very good. Two original horizontal folds. On "Chicago Historical Society" letterhead which cites Angle as secretary and director, Angle notes, "You can count on me for a very brief talk on the evening of February 18. I don't know just what I will say, so make the title general enough to include almost anything." Signed simply "Paul" in bold black ink. At right is a TNS from Earl Schenck Miers (1910-72), 1p, pale blue 5½" X 8½", New York, NY, 5 January 1951. Very good. On "Alfred A. Knopf" letterhead, Miers writes, "When I was in Chicago, Ralph Newman spoke so highly of you that I am most anxious to meet with you personally. Perhaps when you have time you will call me here and we can arrange a luncheon date...." Signed boldly in full in blue ink. A highly unusual facsimile edition with letters from both compilers. Very scarce. This Hawaiian singer, musician and orchestra leader with an Irish name became a popular Big Band vocalist in the 1930s and surfed the wave of Hawaiian popularity, appearing in Broadway productions such as "Aloha Maids" and "Hellzapoppin" before starting up his own Big Band. PS, glossy heavy stock 5½" X 3½", Honolulu, HI, 31 May 1940. Very good. Photograph side is fine, while message/address side bears stains about some margins. Picture postcard with sepia-tone photograph showing Kinney singing surrounded by his band and hoola dancers, captioned "Ray Kinney's Hawaiian Room Orchestra and the Aloha Maids" at the Hotel Lexington in New York; Kinney boldly signs "Aloha / Ray Kinney" in blue ink in the message portion on the verso and addresses it in his neat hand to Arnold F. Gates (1914-93, noted Lincoln and Civil War scholar). Most unusual and fairly attractive despite stains. Princeton: Princeton University Press, 1943. Hardcover. Small 4to. Grey cloth with brown spine lettering, pictorial dust jacket. ix, 220pp. Frontispiece, illustrations. Very good/very good.Jacket slightly edgeworn and age toned, with chips at head and tail of spine; nonauthorial gift inscription on front flyleaf in (what else?) Norwegian. Tight, attractive first edition of the first biography in English of the famed Norwegian violinist. 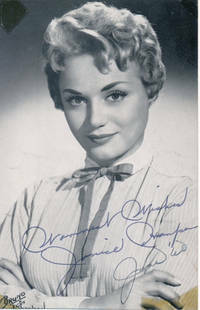 This 1950s pop singer hit the charts with soulful ballads such as the hit "Bon Voyage" (1957) and is often remembered for the 1960 "Cry Me a River" and her album "Embers of Love." 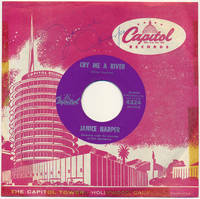 Pink pictorial paper 7" X 7" record sleeve issued by Capitol Records depicting their iconic Los Angeles headquarters, bearing her big, bold signature in blue ballpoint at upper left. Very good. Light stains from long-gone tape along parts of left, right and lower edges. Still houses the fine 45 rpm record of her hit "Cry Me a River" (#4324) and on verso "Just Say I Love Him." Quite scarce in this form. Harper fell into obscurity in later years, though a mini-revival now seems to be emerging, and a signed record of her best-known song is extremely unusual. This 1950s pop singer hit the charts with soulful ballads such as the hit "Bon Voyage" (1957) and is often remembered for the 1960 "Cry Me a River" and her album "Embers of Love." PS, 3½" X 5¼", n.p. Very good, Small inoffensive tape stain at each corner. Nice glossy head-and-shoulders studio portrait (by Bruno) of Harper with arms crossed. Near the bottom she boldly pens "Warmest Wishes / Janice Harper / June '60" in black fineline. She also adds a nice Autograph Note Signed on the blank verso: "June '60 / Dear Donald, / Next week my new / release 'Love Me now or / love Me Never' will be / released. / Janice." A choice piece from the height of her short-lived fame. English musician known as "The first bandmaster of the Salvation Army," for in addition to composing hymns such as "The Lily of the Valley" his family brass band accompanied Salvation Army founder William Booth at evangelical events. Bold, dark signature in brown ink on a 4 3/4" X 1½" lined slip below "Yours truly" penned in another hand, n.p., n.y. Very good. Faint wear, with mounting traces on verso. A nice example of this very uncommon signature. In 1921 an Austrian monsignor, Josef Schnitt, reformed the dissolved Court Choir Boys formed in 1498 by Emperor Maximilian I to perform for the Austro-Hungarian royalty, modernized it and renamed it the Vienna Boys Choir -- the most famous choir in the world, performing in Vienna and around the world. Signature of founder Josef Schnitt (who adds his title, "Rektor" -- rector) in black ink at the top of a heavy stock 3½" X 5½" card, n.p., n.y. [inked date on verso 24 November 1932]. Near fine. 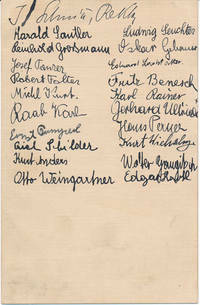 Below Schnitt's signature all 20 members of the choir sign in two columns, all in ink and all fairly legible. The verso of this card is a charming stream-of-conscious autograph request from Thomas, Donald and James Goodrich, who write: "We are just three little Boys we live in the city of Venice in the State of Illinois we are trying to get the autograph names of great People from all over the Land if your Reverence will autograph this card for us Boys we will think it Grand and will you have some of the Boy Members of the Choir autograph the card with there address in Vienna, so we can write to them when they return Home." The Vienna Boys Choir took their very first tour in the U.S. in 1932 and took the country by storm, arriving in New York aboard the SS Statendam on November 15 -- just two weeks before they all signed this card. Extremely unusual and scarce. This Australian basso was a popular performer throughout England and America, often performing Wagner roles; he made some early (turn of the century) recordings and appeared in one silent film as well. Extra-bold and attractive "Yours Faithfully" and signature in black ink on a heavy stock 3½" X 2½" card, which he dates "Chicago 1898." Very good. Tiny mounting traces. A handsome example. This famed Dutch violinist played for and served as concertmaster for a wide variety of American orchestras, including the Pittsburgh Symphony Orchestra and the San Francisco Symphony Orchestra. 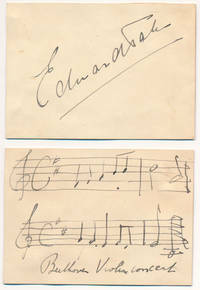 Large and bold signature in ink on a 3½" X 2½" slip neatly mounted to heavy stock card, n.p., n.y. AMQ (unsigned) on a matching slip, n.p., n.d. (both bear pencilled 1904 date on verso). Both near fine. The unsigned Autograph Musical Quotation consists of two lines, being several bars of music which he identifies below as "Beethoven Violin concerto." Tak played first violin with the Chicago Symphony Orchestra from 1903 to 1905 when he penned this excerpt from the Violin Concerto in D major, which became one of Beethoven's best-known violin concertos. An attractive example. Boston: C.W. Thompson and Co, 1919. Hardcover. Small 4to. Green cloth with gilt lettering. viii, 264pp. Line drawings. Near fine. Endpapers lightly age toned. A tight, handsome fourth edition of (to cite subtitle) "The Acoustical and Musical Effect of Combining Individual Stops, and the Selection of Stops and Combinations for the Various Phrases of Organ Compositions; Together with Suggested Registration for One Hundred Organ Compositions, Hymns, and Anthems Intended to Be Played on Specific Organs." Despite title page year of 1919, this later printing was surely published much later.